Solution: Given two binary trees, return true if they are structurally identical. In pic 1. We have two identical trees, both in terms of structure and values. So, in this case, we would return true. Now, let's think about how trees could be different by drawing out a few more trees, as in pic 2. Here, we have three trees that are all different. So, our algorithm needs to ensure that we can distinguish for both of these cases. Now, let's start thinking about an algorithm, since we have a good idea of the examples. 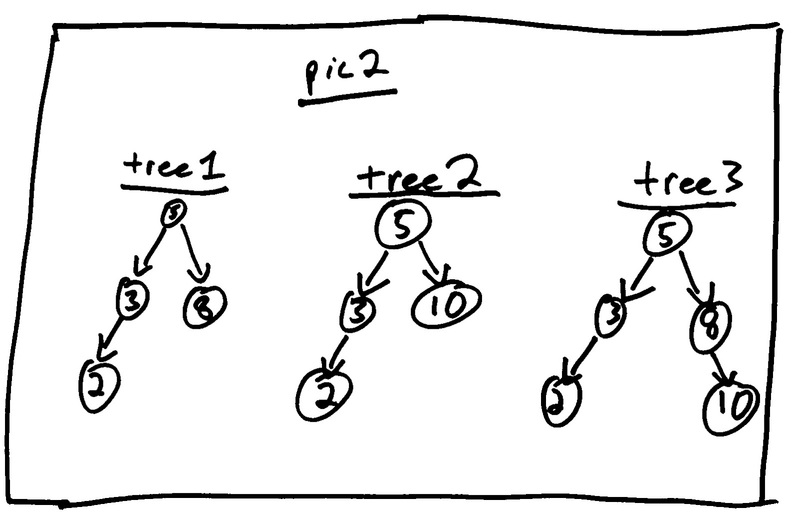 Since we need to determine if the trees are identical, at a minimum, we're going to need to compare every node in the trees (as we can't say for certain that they're the same until we have done that). And, upon finding one difference, we can immediately stop. Let's think of how we would do this intuitively. Let's start by doing this with pic1, where we have two of the same trees. We can start at the top node, and then look at each lower level, left to right and say, are these nodes equivalent in terms of: 1) their values, and 2) having the same ancestor structure. This algorithm is intuitive, and also should work. 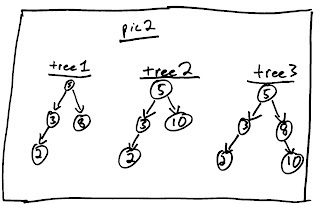 It is essentially a breadth-first search of each tree, comparing the nodes as we go. Alternatively, we could try a depth first search, comparing the two nodes, which would also work. Now, let's think about implementing the solution. At first, it may be tempting to think about using functions like a pop, where we could pop nodes off of each tree and compare them, and return false if they are not equivalent, and true if we get to the common ends. This would work, but let's say that it is clearly an inelegant solution, and assume that it's not allowed. //one is null and one is not, so they're not the same. Amazing, two lines of code for what seemed pretty challenging. Let's check our sample trees in pics 1 and 2. Yup, it works for those. Now, let's think about base cases. If one tree is null, or either node is null, we catch that immediately in the first line, so there is no concern of having a tree of null, or of de-referencing a null pointer. And, for run-time efficiency, in the worst case, this requires looking at every node, so it is O(n). There is some recursive overhead too, which is worth mentioning to the interviewer. Please let us know if you find bugs in this solution, have alternative solutions or other ways to solve this problem! binary possibilities, as well as electronic digital possibilities while they're also known as, usually are investment decision possibilities that usually offer big earnings. You'll find investors that have come to be millionaires dealing most of these set as well as telephone possibilities.